Meet Monastiraki. 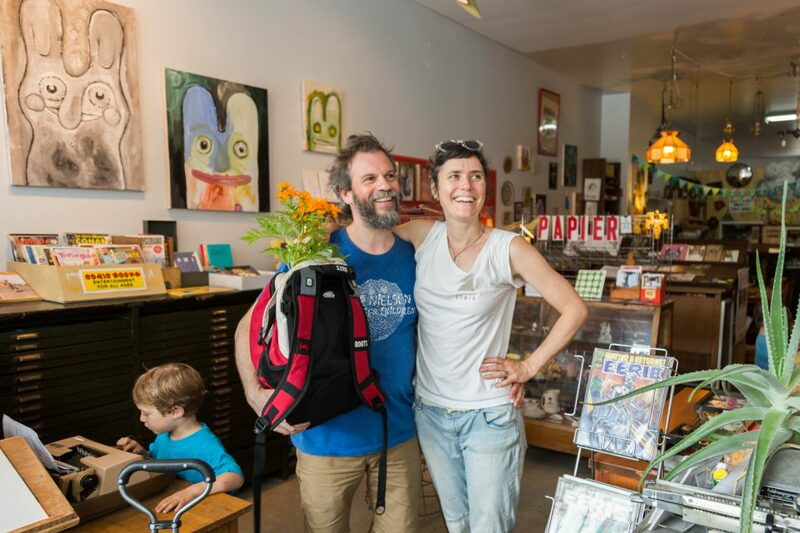 Member of Montreal's, Mile-End Business Association. 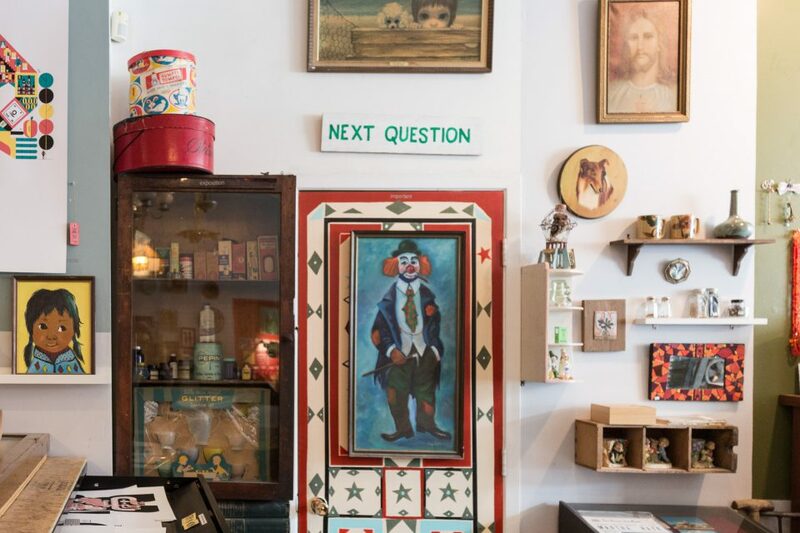 Talking bunny demons, dyke zines, curiosities and more with artist and co-owner Billy Mavreas at his atypical gallery-shop. 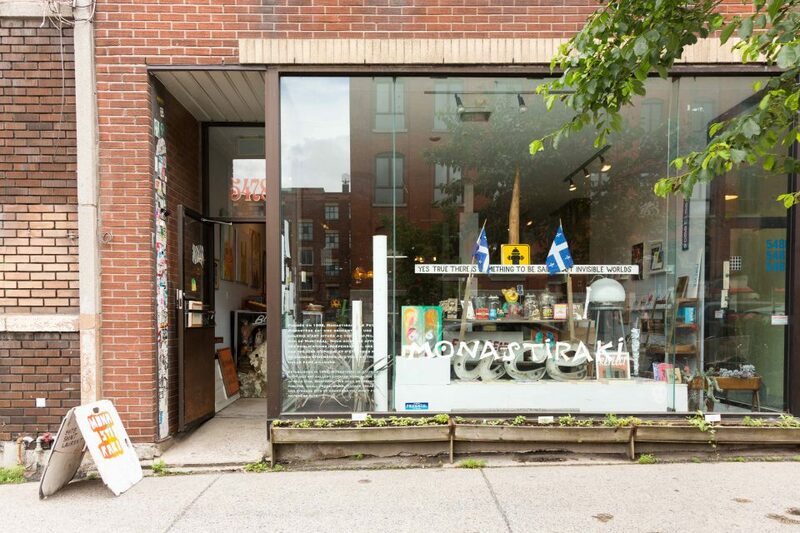 It’s safe to say Monastiraki is more than a gallery and a shop, it’s a connector. Many artists are up for discovery here. Correct. We are a shop with a lot of different artists within it and different styles colliding. It’s not just me and Emilie’s personal vision — Emilie O’Brien is my partner in this operation, an artist, writer, art restorer, mother and awesome person. It’s a crossroads between ‘What is a gallery?’ and ‘What is a shop?’ It’s an organic growth over the years so it hasn’t been ‘unveiled’. There are a lot of shops around that have been ‘unveiled’ — they’re ready, and finished, the ceiling is done and they are gorgeous, but there is no sense of history and it’s evident. And that’s okay … But crossroads and history and stories and memories and different communities come together here. I think that’s important. It’s also hard to ‘brand’ that, sadly! What’s happening all over the world, and I don’t want to say ‘death of authenticity’, but what’s happening is this transition to very intentional spaces. Where the accidental and organic growth of something can’t afford to live anymore. 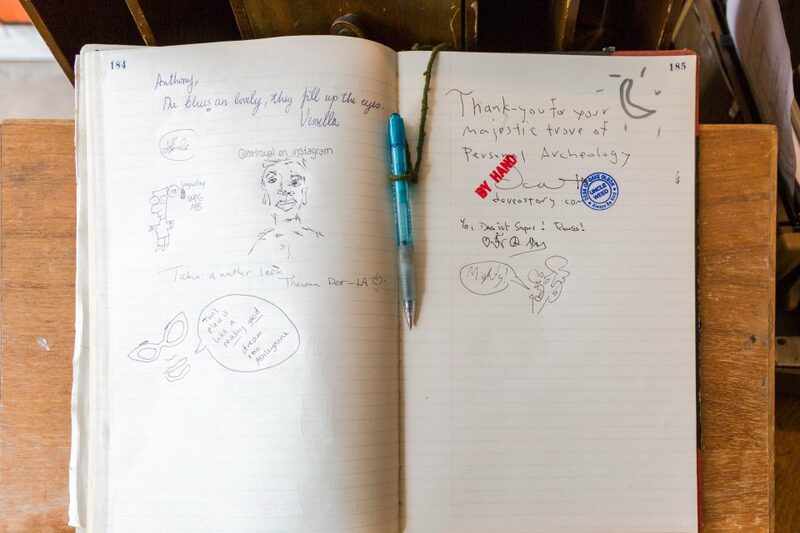 People write in my guestbook, “Love your concept”. We don’t have a concept. There was no grand unveiling of our twenty years of dust. Thankfully we had the opportunity to do that slow growth. You can get a piece of art from $10-$200 versus $5,000. Aspiring or beginning art collectors can buy a print for $20, or $40 if they want to get crazy! What does the name Monastiraki mean? It means small monastery. It’s a neighbourhood in Athens, Greece, with all kinds of little laneways full of flea markets. There are all kinds of people — buskers and Rastas and punk rockers, a very vibrant place. Then right à côté is all the tourist-y shops. So that’s Monastiraki and my father and uncle opened this shop in 1998 and they named it that because they were hard pressed for a name for their antique shop. 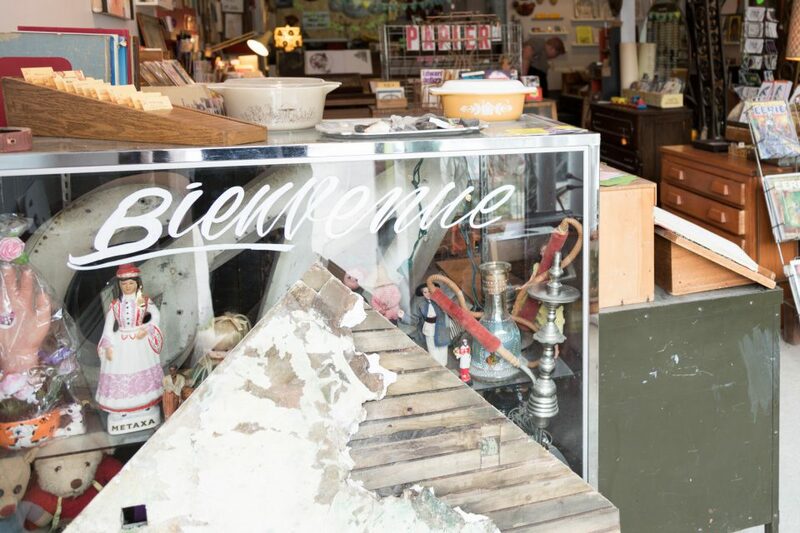 Back then our shop was full of furniture, lamps, chairs, art, crystal… every square inch was covered. 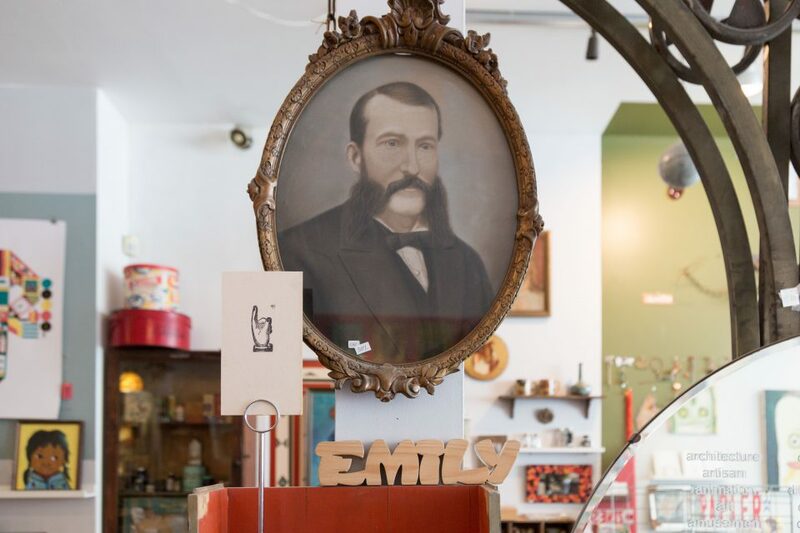 Have you kept anything from the space’s former antique-shop days? Over time, I dismantled everything to suit myself as an artist in need of a studio. There are a few pieces like M. Moustache there in the oval frame. He’s been there forever. I don’t know who he is but it’s a hand painted portrait in a beautiful oval frame carved dating from the 1880s. It’s one of those things that might stick around here forever because I don’t want to let it go for $100, you know? And beside M. Moustache — is that a pair of handcuffs? Rubber handcuffs, yes. For boudoir games. Ahh, a collection of all kinds. The name makes perfect sense. When did you take over the shop? In 2000 and with the help of my friend Jen MacIntyre (a Mile-End film maker, musician and jill of all trades) and later with my partner Emilie we’ve slowly made the space what it is now. I’ve taken up more space because I am an artist first and foremost, not a merchant. I’ve given myself more room be to here in an alive way. People would come in and say, “Is this a collective?” I’d say, “No”. It’s us and we are inviting artists to be here. Or they’d say, “Are you an artist?” And I’d say, “Yes”. And they’d say, “Where is your stuff?” And I’d scramble to look for my stuff in the shop. It was foolish. In your perspective, what’s the difference between running a business of this kind as an artist vs. an entrepreneur? I’m not an entrepreneur. This is a business but it’s evident I am not a business person. A business person will have a plan and choose things based on the priority of sellability, whereas we go for aesthetics or vibe. All the artists we’ve ever worked with have walked through these doors. I have a face-to-face with them. I am not sourcing on Etsy. You can fill the Olympic Stadium with beautiful items from Etsy and buy, buy, buy as much as you like. I don’t care too much about that. That’s not where I’m coming from. For me, just like I want for the person that comes in here, it’s about discovery. 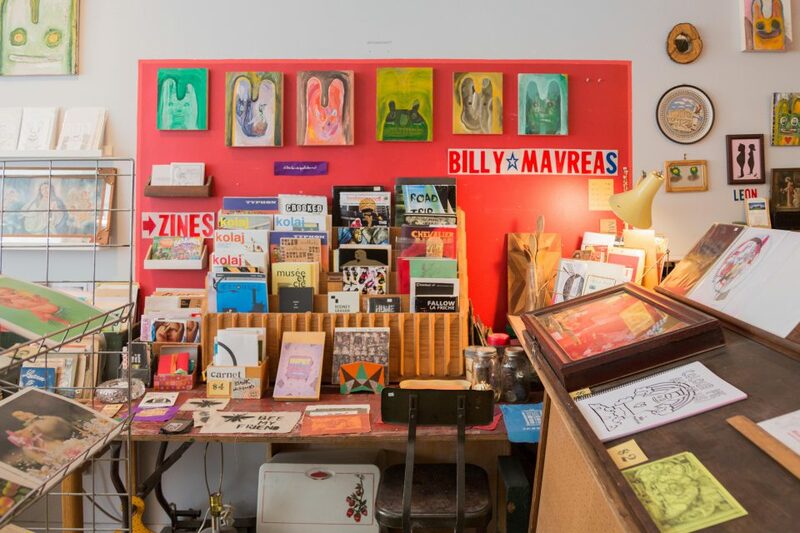 How do you select the artists you bring into the shop? A lot of people just come in and have something to show and I’d be like, “Okay, let’s go!” It doesn’t work like that so much anymore. I used to not pick people and people would pick us. They come in, show us their stuff, together we decide how much it’s going to be sold for, and that’s it. As time goes on, me as an artist, I’m taking up more room. I’m putting my paintings on the wall and my name is right there. What spurred me on was the realization that I’m not going to be here forever, we are almost at our twenty years, and I don’t want my legacy to have been the guy who used to have a shop. I need to springboard to the next phase of my life. It’s always going to be in the arts. So I thought, might as well make this a showcase of my work. If I decide to get out of retail, god willing, I’ll have developed a bit of a visibility as an artist. Please show me your work. What do you make? I do books. 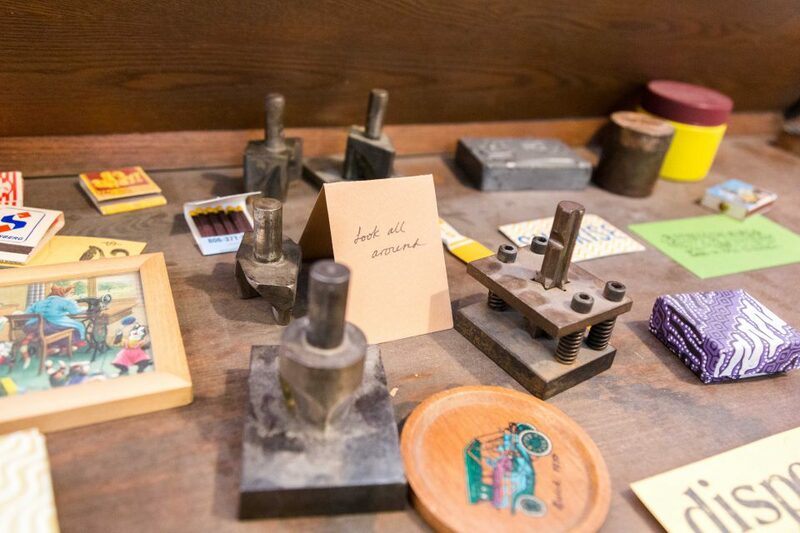 Rubber stamping. I teach workshops. Creative collaborative roundtables where I lead the whole thing. I’ve done two eight-week-long master classes for the Québec Writers Federation in what’s called Hybrid Literature — which is basically telling stories with anything at your disposal. Collage, drawing, text, making little zines. I am one of the Co-Founders of (but no longer involved in) Expozine which is a very large, small-press, comics and zine fair. I’ve also been making rock posters since 1986 in Montréal. Could you introduce me to some of the artists you represent here through their work? Sure. We’ll start with Todd Stewart who has a background in urban design and architecture. Here’s a silkscreen print of Place Ville-Marie. He also has an array of cities. Here is Winnipeg, and Rio, and Hamilton, Ontario and Sao Paolo … His Montréal print is beautiful. 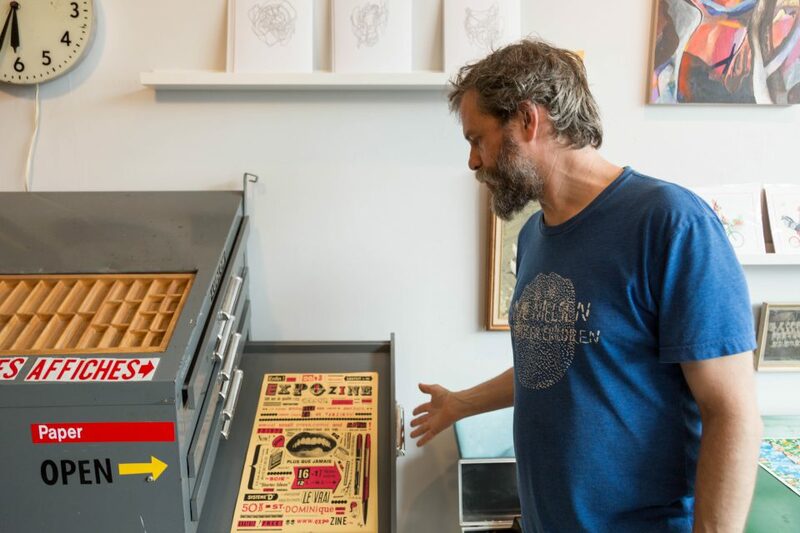 Graphic designer and rock-n-roller Raymond Biesinger does these very famous posters and he’s done illustration for every website or magazine you’ve ever heard of. These portraits of Montréal are very popular. 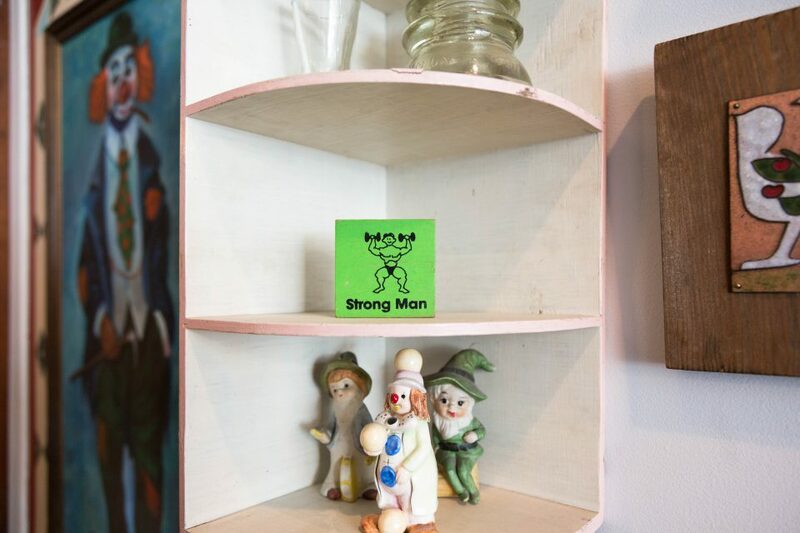 If you look for an apartment in Mile-End on AirBnb you’ll see this in the background hanging on the wall. 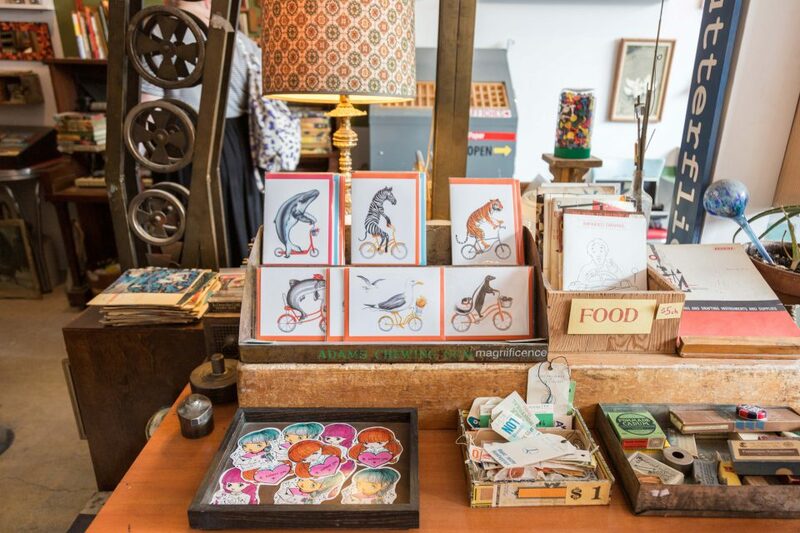 Amélie Legault does these really charming animals on bike cards and prints that sell out. Life and Times of Butch Dyke zines is another one. They are text and image biographies of lesbian artists and public figures. Eloisa Aquino is the woman who does this. It’s called B&D Press. 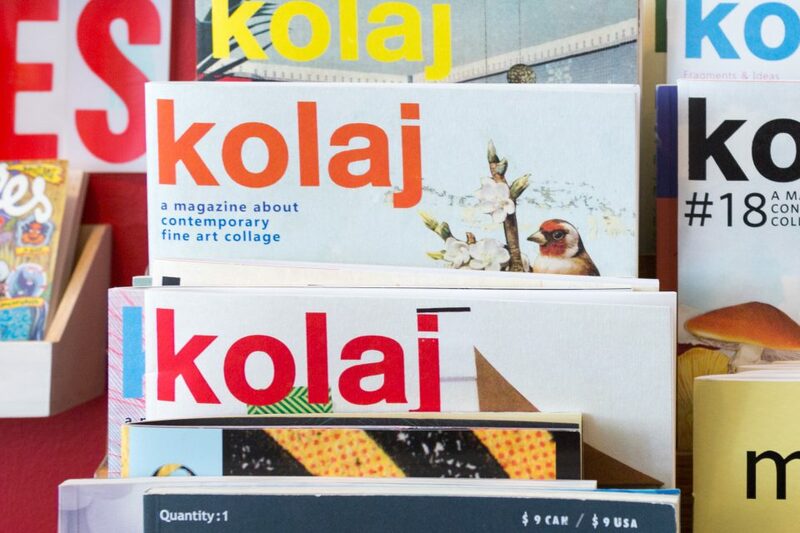 Kolaj is a nice local magazine about contemporary fine art collage. It comes out from Montréal and shows all different kinds of artists. It’s fantastic! Scraps of paper. I like things that don’t necessarily have a market value. Hence the artist versus businessman persona. People come in here and ask, “Do you have fountain pens?” No, I don’t have fountain pens. I don’t have watches. I don’t deal with coins. I don’t care about Coca-Cola. Sure you might find a beautiful Coca-Cola tray … (clapping) … Bravo! I like … here, this is what I like (walks over to a display) … Here is an entire contemporary art show in a box. These are one dollar hand-written notes. This is found stuff. Where did you find these letters? On the street? Do you pick up pieces of paper when you walk on the street? I do. Nothing is going to go by me. 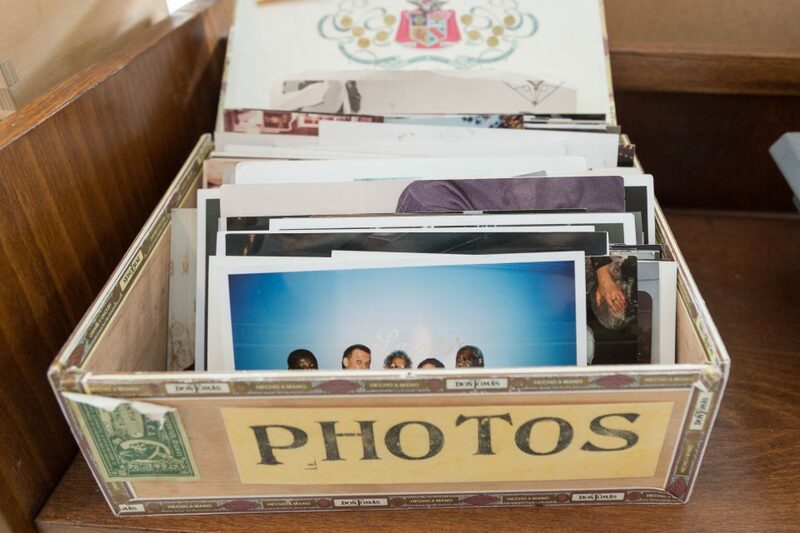 I have all these found photographs. Generally there are two different approaches. One, “Eww! Why would anybody want to have somebody else’s photograph?” And then there’s the, “Cool!” And they go right through it and they buy something. 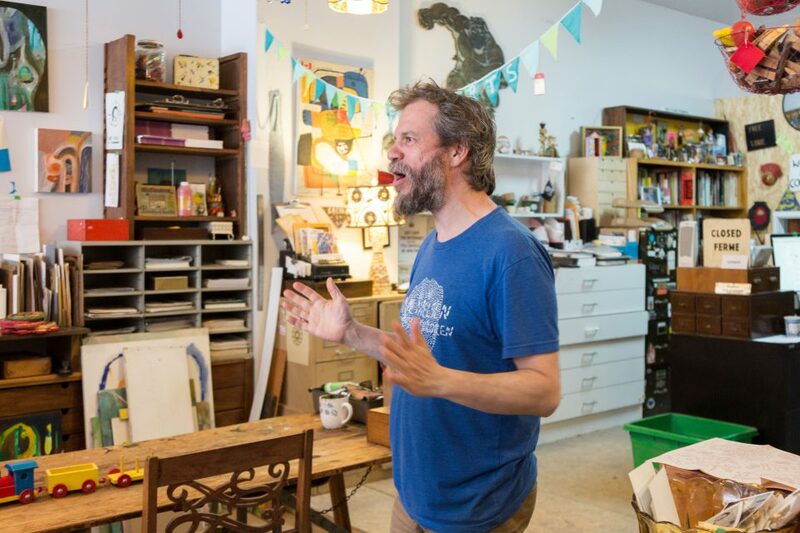 There was an article in Le Devoir about found photographs and they interviewed me. It used to be one of those things, when I was younger, I’d find some kid’s grad photo on the street and carry it in my wallet for fun because that’s where you put it, to protect it. My imaginary friend. 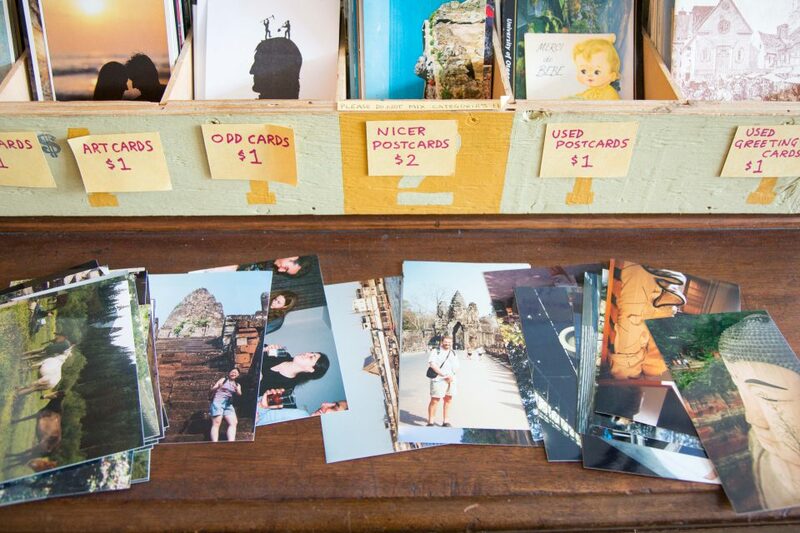 But then what became my little parcel of found photographs got mixed in with truckloads of found photographs which happens when you have a shop like this. It’s a weird thing, the transition between the personal and “en vrac”. This is exciting for me, it’s fun stuff. 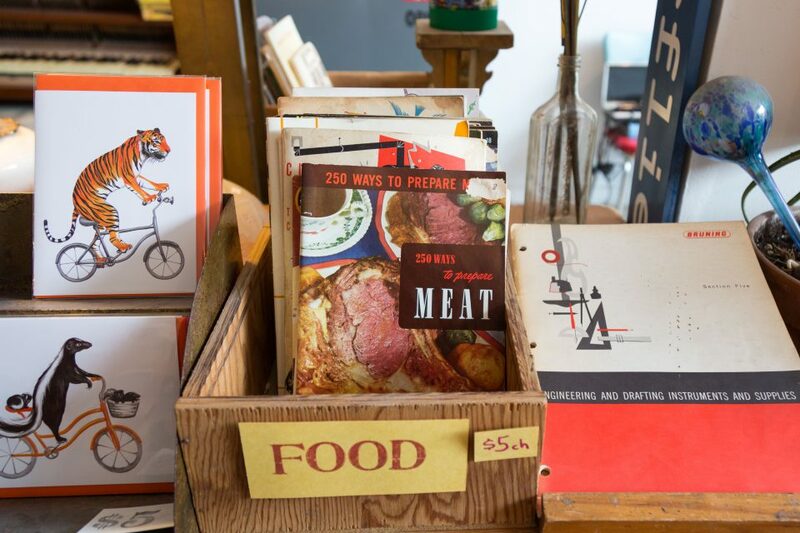 To be brutally frank — Are you a hoarder? No. This is it. I like paper. Maps. Brochures. Comic books. Stickers. Envelopes. I like photographs. I have a collection of children’s drawings. A lot from kids that we know but also, we do workshops here with kids. We had a toddler art show here several months ago. They were able to make art and stick it up on the walls. We did a call for submissions in our community (from parents) to children. Santa Claus has been here a few times too! What’s the story behind the ‘Next Question’ sign? I made it. No story really except I get a lot of questions asked me. I make a bunch of signs around here, they are for sale. I also made this graphic novel and a colouring book for kids. There’s a lot of text-based visual art. Signs and text is natural for me. I write about language and just thoughts. I did English Literature in school a million years ago and a lot of posters I did in the mid-90s were for spoken word events. 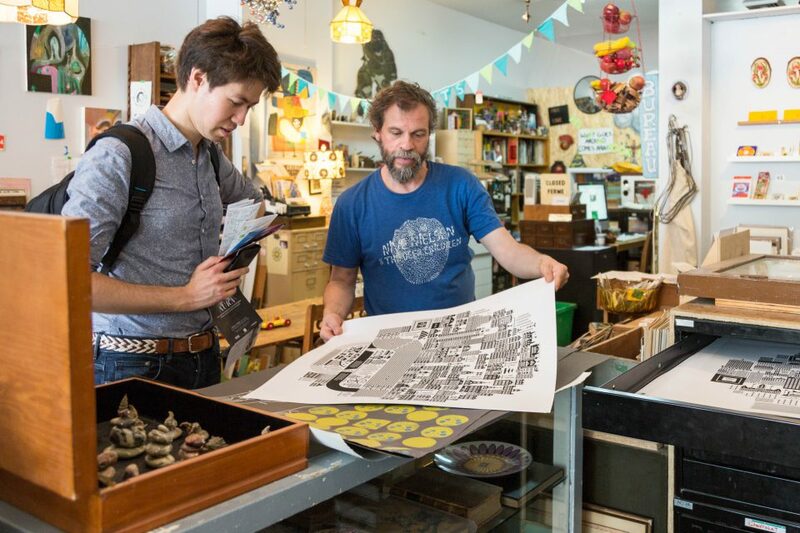 The final must-ask question — What are a few of your favourite places around Mile-End? I used to say, go to Riddells on Bernard but it’s no longer there. It was a tackle shop owned by this perfectly cranky old man. It was mind-blowing! It was the most idiosyncratic, weird place, ever. So that’s gone. But in terms of what’s still here, I think the Polish restaurant Batory on St-Viateur beside the church is quite special and I never want it to go. I have the spinach soup. Go there with a friend and split the Polish Plate, it has a bit of everything. I like Ta Chido on av. du Parc very much. It’s unpretentious, fun and easy with all the toys in there. You feel the guy’s touch. It’s not trying to be anything but good and fun. I go to S.W. Welch all the time for secondhand books and have made bookmarks for them too. I go to Café Club Social. Today I got my sandwich from a Vietnamese place, Sencha. Casa del Popolo and La Sala Rosa are great too. Mile-End is the kind of place you can just discover yourself by walking around. Get a feeling of how people live. There is a whole neighbourhood to walk around – for free. It’s amazing. When I look at a tour group and have never seen the guide in my whole life I’m like, “Where are you getting your stories from?” It’s not like you have to go to this bagel place versus that bagel place or this coffee or that thing. I’m not so fanatically loyal. Paying to tour Mile-End is a bit of a joke to locals but what I think is good about the tour groups is that the people within the groups connect with each other. Right? You’re waiting in line having an ice cream or a golden Mile-End falafel and then you meet someone new. You learn about each other.